Part 1: Set up your local Minecraft and Docker development environment, and start playing with Minecraft on your own server. Part 2: Set up your local Eclipse development environment, and then develop, build, and export your own server-side Minecraft plugin into a local Docker image. Part 3: Deploy Docker images to IBM Cloud, and run them as Docker containers that are accessible through the cloud. Part 4: Extend the Spigot server with a plugin that uses Watson cognitive services on IBM Cloud to add a little science to your game play. In Part 1, Part 2, and Part 3, you saw how to start your own Minecraft server inside a Docker container, first locally and then inside a container on the IBM Cloud. You also learned about building server-side plugins for Minecraft and adding those plugins to the Minecraft server running in Docker. All of that was a prelude to this tutorial, the last in the series, which shows you how to use the power of the IBM Cloud environment in your plugin development, and at the same time add a little science to your game play in Minecraft. In this tutorial, you’ll see how to extend the Spigot server with a plugin that uses the Watson cognitive services. IBM provides several Watson services on IBM Cloud that you can use to build cognitive solutions. These include the Watson Assistant service, Personality Insights, Natural Language Classifier, Visual Recognition, and more. Browse the complete list of Watson services. 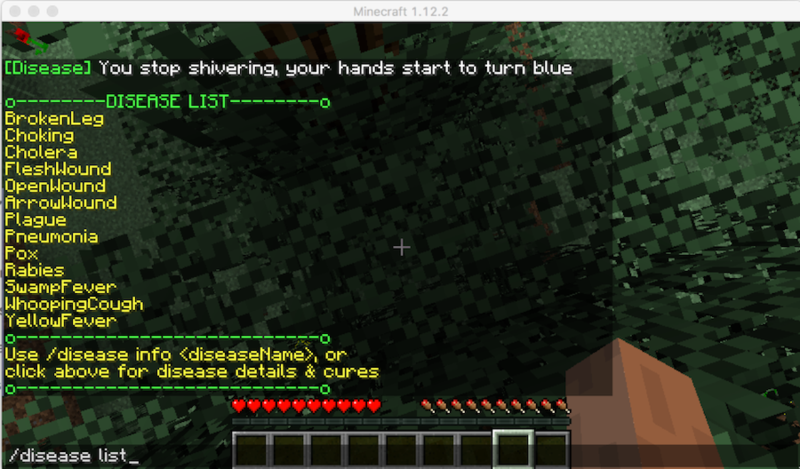 In this tutorial, you’ll see how to build a plugin that uses the Watson Assistant service to answer questions about diseases — and then how to combine that plugin with another third-party Minecraft plugin that adds infectious diseases to your Minecraft villages. When you combine the two, players get a reason within the game to learn about diseases, as well as how to diagnose and treat them. This proof-of-concept integration shows how you can combine third-party plugins with your own plugins to use the power of Watson and IBM Cloud. Let’s get started. First, we need to obtain an instance of the Watson Assistant service and get some credentials from that service instance in order to use them in our new plugin. Then we’ll build the plugin and install it into Docker and push that into the IBM Container. Create an instance of the Watson Assistant service by selecting the Catalog link, navigating to the Platform > Watson section of the Catalog and selecting the Watson Assistant link from this section of the catalog. Leave the default values in the create a Watson Assistant screen that appears next and click the Create button to create an instance of the Watson Assistant service. Take note of the name of the Watson Assistant service you just created. In the lower left, you can click the View Docs link to learn more about the service and the REST APIs you can use to access it. Create a new app by selecting the Catalog link, navigating to the Cloud Foundry Apps section of the Catalog and selecting the SDK for Node.js link from this section of the catalog. In the Create a Cloud Foundry App form that appears, Specify an APP Name that is unique (we use WatsonSpigotApp in our example). Leave the other default values and then click the Create button. This action will create and start an instance of a Node.js Cloud Foundry app. Navigate to the Connections page by clicking Connections in the left column of the newly created SDK for Node.js app. Add the Watson service to the app you just created by clicking the Create Connection button, search for the name of the Watson Assistant service you created in the previous step and Click the Connect button. This action binds the Watson Assistant service and restages the app. To retrieve the credentials for the newly created Watson Assistant service, expand the drop-down menu on the right and click the View Credentials menu items. This opens a dialog box with the endpoint URL and username and password. 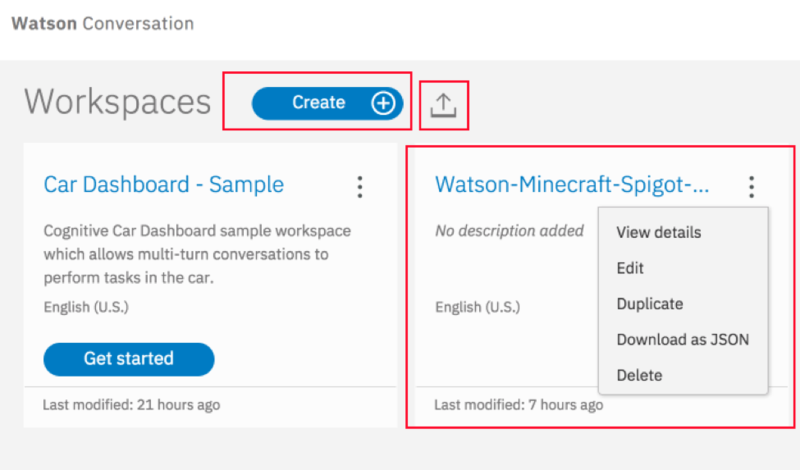 In the Watson Assistant service, a workspace is a named container for conversation artifacts (namely intents, entities, and the dialog), and has an optional description and language associated with it. Intents are words and strings with synonyms that represent the intent of the user’s input, entities are objects that are related to intents, and the dialog represents the conversation flow which includes intents and entities. Workspaces can be exported and imported to and from JSON with a maximum size limit of 10MB. Workspaces can be created and managed via a REST API or the Watson Assistant web dashboard interface. They can also be shared with members of a team who collocate when developing and maintaining a conversation service. what diseases do you have information on? Please see the Watson Assistant service online documentation to learn more about intents. Entities are terms or objects related to intents. For the sample intent “#information-on-diseases,” related terms or objects could be disease type, symptom, treatment, etc. The name of an entity is always prefixed with the “@” character. Entities have values associated with them, and those values can have synonyms or patterns associated with them. Like intents, entities can be imported from or exported to an external comma-separated value file. The sample conversation accompanying this tutorial contains a single intent called “@disease” and several values of the entity such as: diabetes, measles, and the flu with examples like cold, cough, and influenza. The Watson Assistant service also provides a list of system entities such as @sys-date and @sys-time which can be applied to any conversation. Please see the Watson Assistant service online documentation to learn more about entities. A dialog represents the flow of the conversation that reacts to intents and entities with responses. It is represented as a set of dialog nodes that are connected depending on the flow. Each node contains at least one condition and one response. A condition represents the input that meets a specific criteria such as a matching intent or entity for the dialog node to provide a response. The response can be an answer to a question or an action to be executed, depending on the intent. The dialog can be structured to request additional information when the information provided in the intent or entity is not sufficient to respond to a user’s request. The context of the conversation can be captured and stored in context variables. In a dialog, nodes are evaluated from top to bottom. Dialog nodes can contain child nodes. When a node that has child nodes has been triggered, the conversation is evaluated against its child nodes, traversing the depth of the conversation tree and evaluating each node along the path. Default handling is also available when an unrecognized or unsupported intent or entity is encountered. The dialog can be created and managed via the Watson Assistant web user interface console or using the REST API. Please refer to the Watson Assistant service online documentation to learn more about creating dialogs. In this tutorial, a sample Watson Assistant workspace has been provided on GitHub that contains a dialog with intents and entities. Executing a curl command to invoke a Watson Assistant REST API providing the workspace JSON as input (details provided later in the tutorial) creates a workspace with the dialog that is depicted in the image below. This dialog can be modified as desired, or a new one can be created. 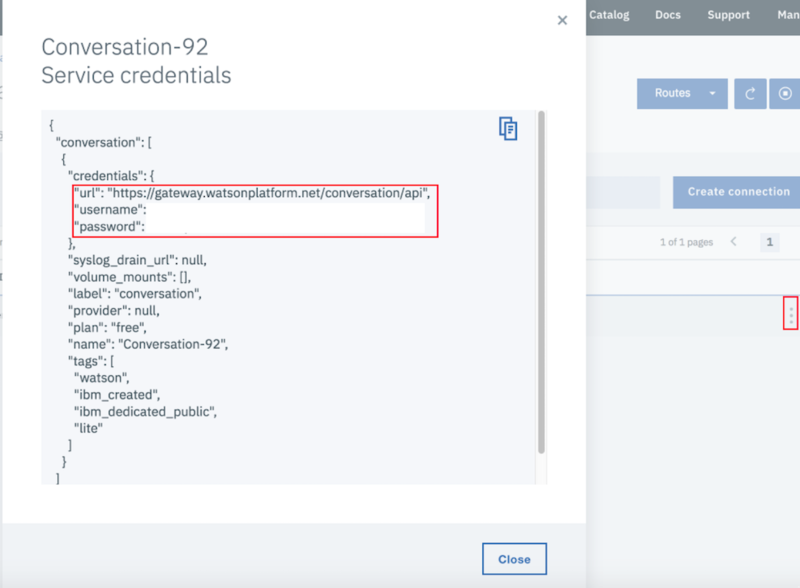 You can examine the Watson workspace JSON, WatsonConversationTest.json, or navigate through the workspace and modify the conversation from the Watson Assistant web dashboard once it has been created. As you extend the conversation sample or create a new one, you will want to add more intents. Note that the workspace, along with the intents, entities, and dialog, can be created and managed using the Watson Assistant web console or via the Watson Assistant REST API. 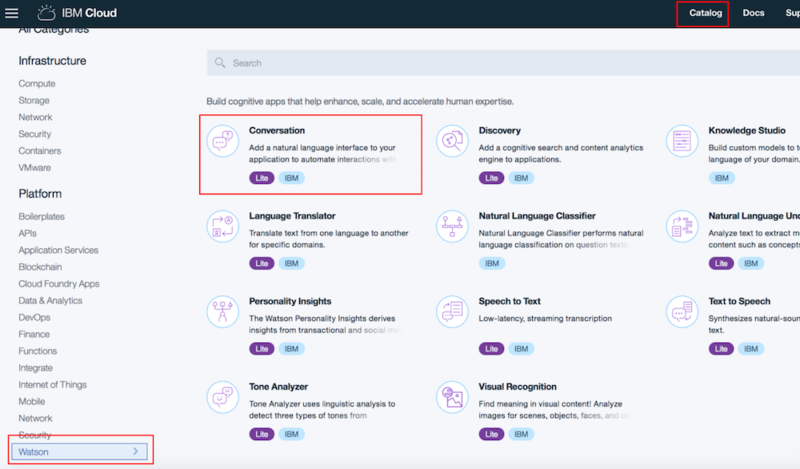 To learn more about the Watson Assistant service, intents, entities, dialogs, and conversations, please refer to the Watson Assistant documentation that’s available on IBM Cloud. In this tutorial, the Watson Assistant Workspace with intents, entities, and the dialog will be created using the create workspace API via the curl command. The input to the API is a JSON called WatsonConversationTest.json that has been created and is available in the spigot-plugin-watson/input/ directory. Note the workspace_id that was created. You can navigate to the Watson Assistant service web console by clicking the Watson Assistant service link that’s available in the Connections tab of the WatsonSpigotApp you created in step 4 of the previous section. After successfully launching and logging into your instance of the Watson Assistant service, you will notice the new conversation workspace that you just created with the curl command. You can navigate through the workspace and look at the intents, entities, and dialog that were created and modify it to create a more complete conversation with additional intents and entities if desired. Now that you have the right credentials, we can build our Spigot plugin. 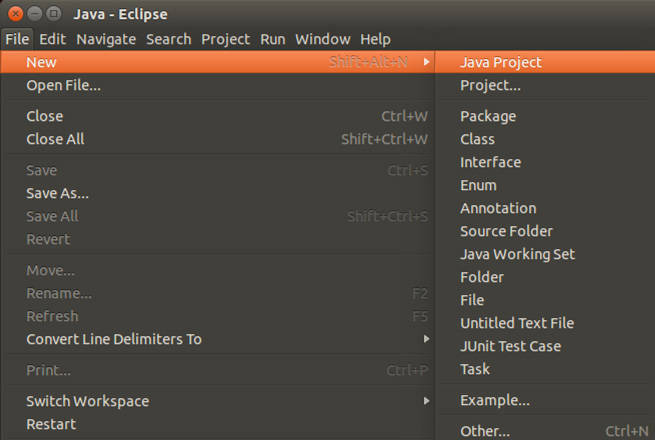 The directory minecraft-project/spigot-plugin-watson/ includes the sample source code, libraries, and related artifacts to create an Eclipse project that is referenced in the rest of this tutorial. Download the Watson Java SDK from https://github.com/watson-developer-cloud/java-sdk/releases/download/java-sdk-4.2.0/java-sdk-4.2.1-jar-with-dependencies.jar. More information about the SDK and examples can be found on GitHub. java -jar minecraft/BuildTools.jar When these steps complete, you should have a craftbukkit-1.8.8.jar in your directory. 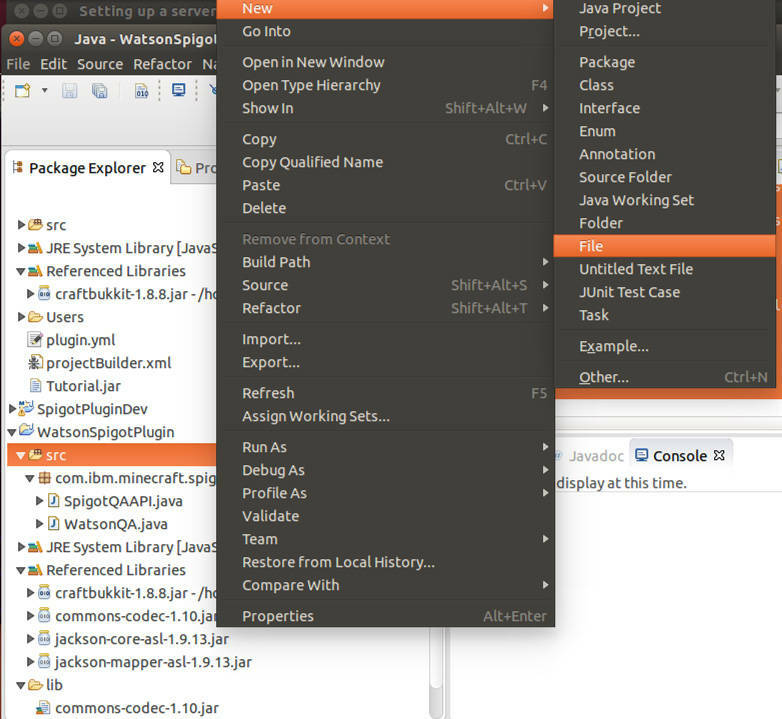 Create a new project by selecting File > New > Java Project. Specify the name as WatsonSpigotPlugin. Click Next, and under Libraries, click Add External Jars…. 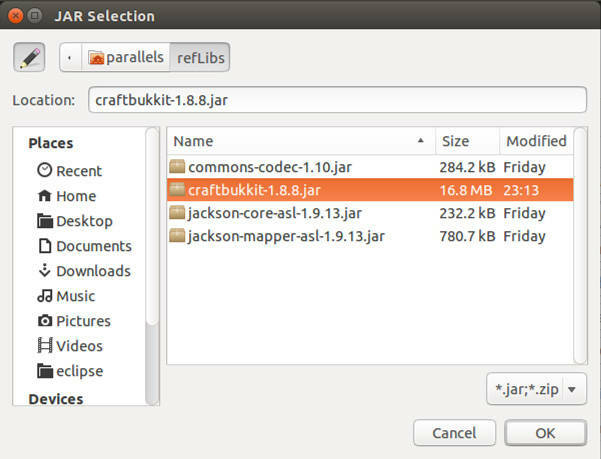 Navigate to $HOME/reflibs and select craftbukkit-1.8.8.jar. Click OK, and then click Finish on the next screen. 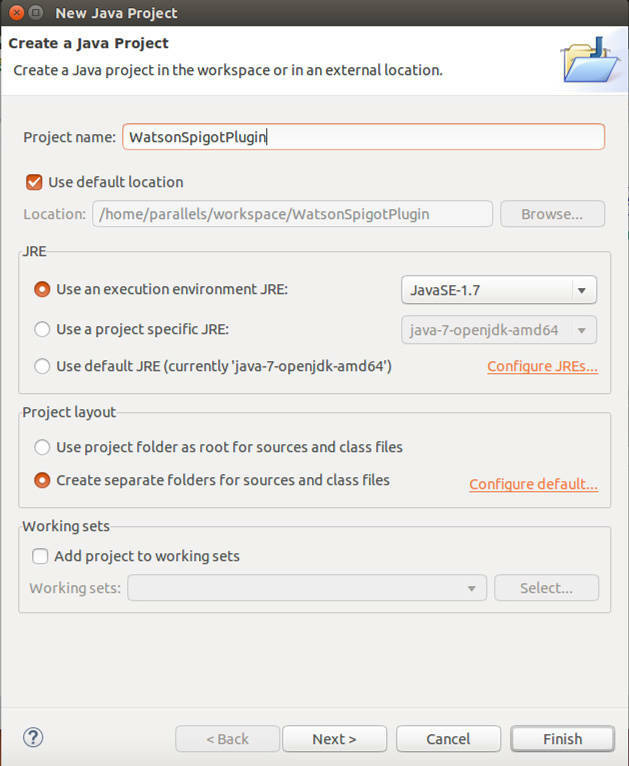 A new project will be created in your Eclipse workspace with the name WatsonSpigotPlugin. 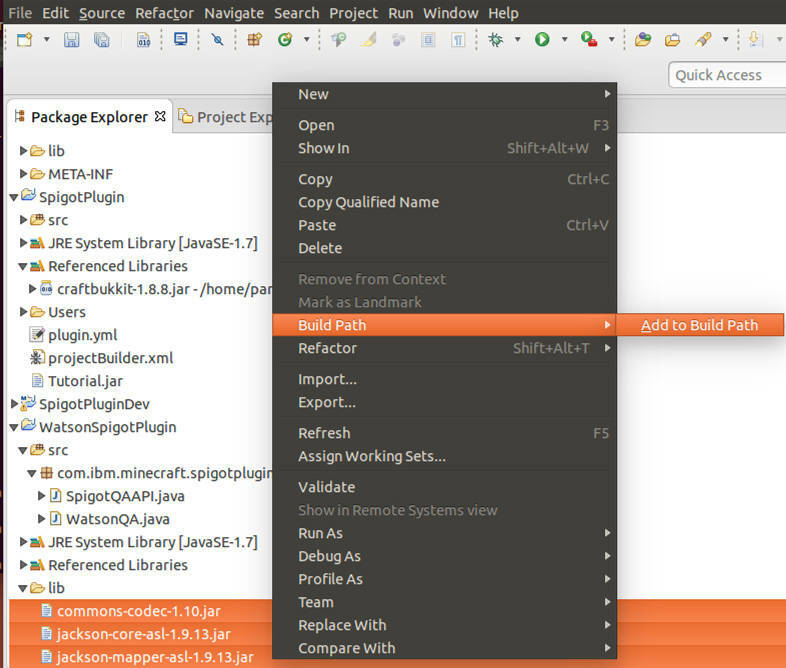 Add these jars to your project’s build path: Select them in Eclipse, right-click, and then select Build Path > Add to Build Path. Create new package and name it com.ibm.minecraft.spigotplugin. 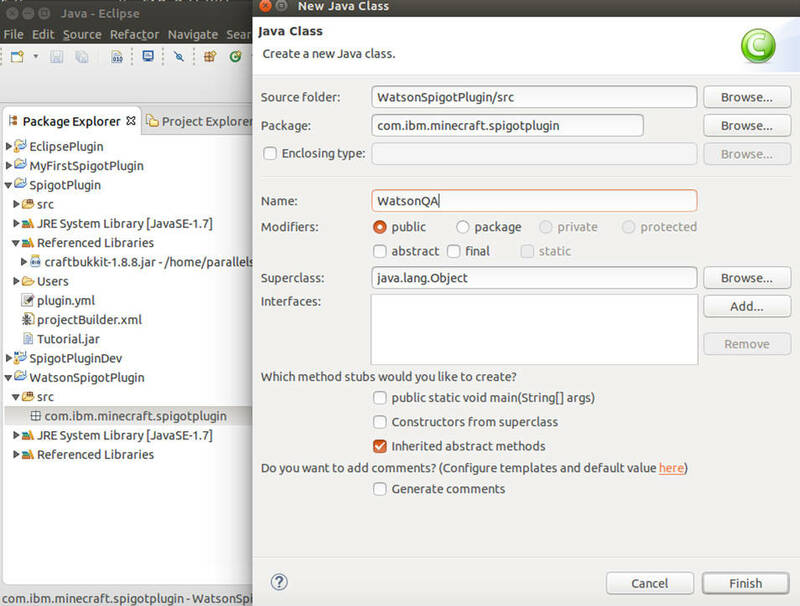 Under the package com.ibm.minecraft.spigotplugin, create a new Java class and call it WatsonDialog. 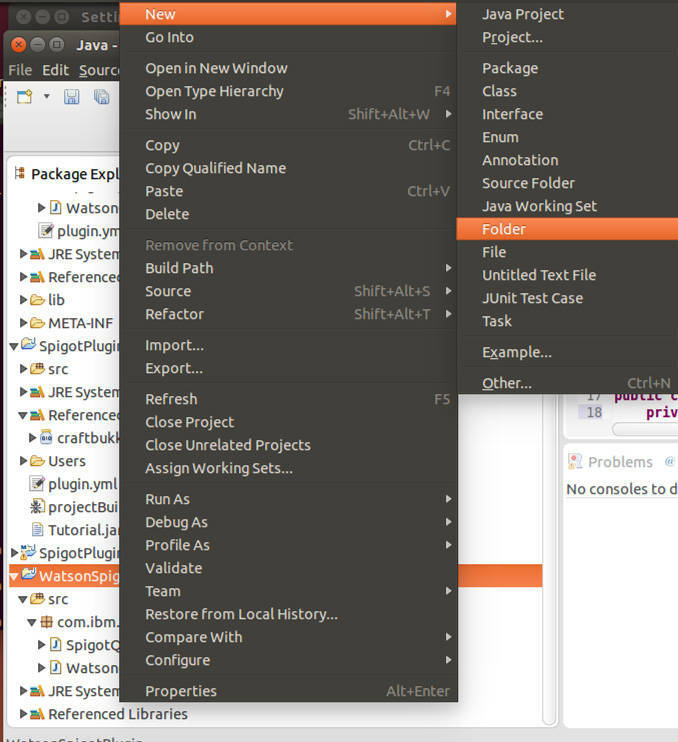 This creates the new class and loads the file in Eclipse. 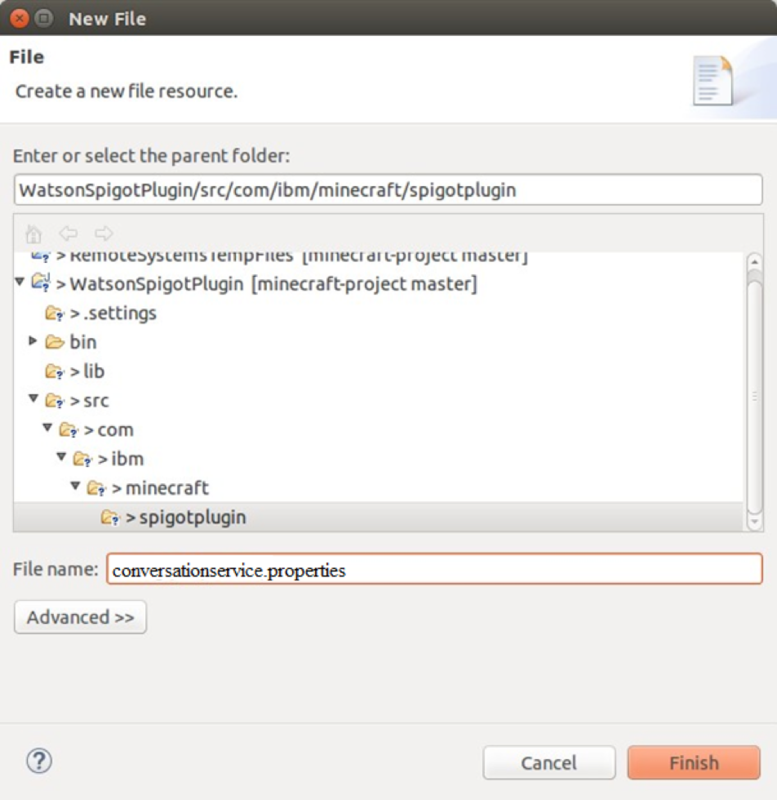 The sample code in WatsonConversation.java is similar to the sample code for getting started with plugin development for the Spigot server. To provide the server with information on the Watson plugin, add a new file in the src folder by selecting src > New > File, and name the file plugin.yml. Note about WatsonConversation.json: The WatsonConversation.json file is the basic controlling file that is used to create the dialog scenarios used in this project. 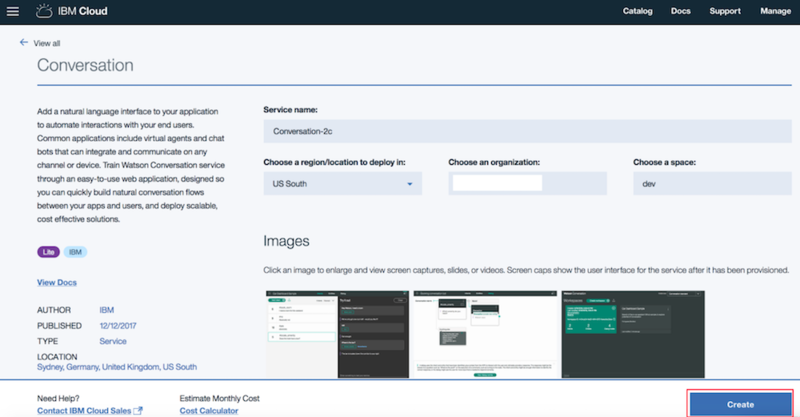 The configuration of WatsonConversation.json and additional information on how to define intents, entities, and dialogs as well as manage workspaces can be found in the online documentation. Define a MANIFEST.MF to reference the dependency jars for the plugin. Under the WatsonSpigotPlugin project, create a new folder and call it META-INF. In the META-INF folder, create a new file and call it MANIFEST.MF. Add the following lines to MANIFEST.MF. Make sure that last line in the file is a newline (carriage return). 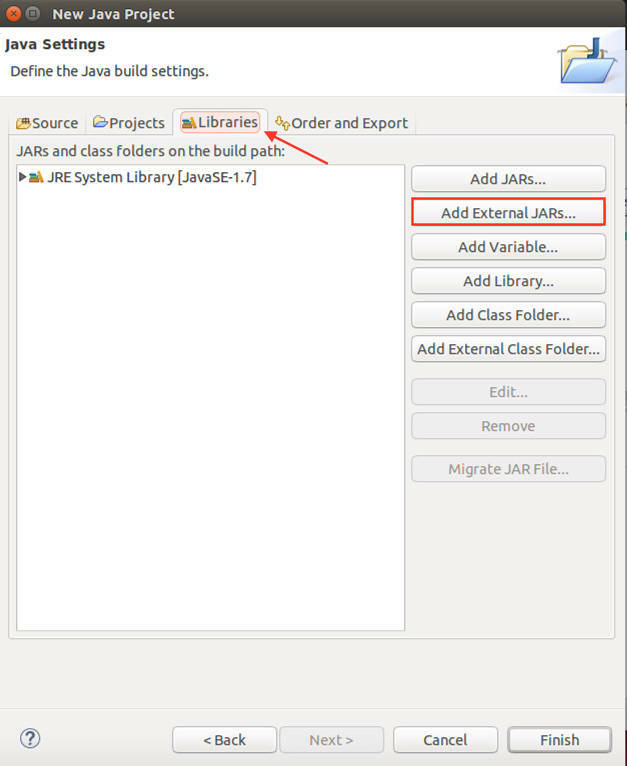 Under Java, select JAR File and click Next. Under Resources to Export, select WatsonSpigotPlugin, uncheck .classpath and .project, and specify the destination of the JAR as the same directory where you’re starting the Spigot server ($HOME/watsonspigot) and call it watsonqa.jar ($HOME/watsonspigot/watsonqa.jar). Click Next (don’t click Finish yet). 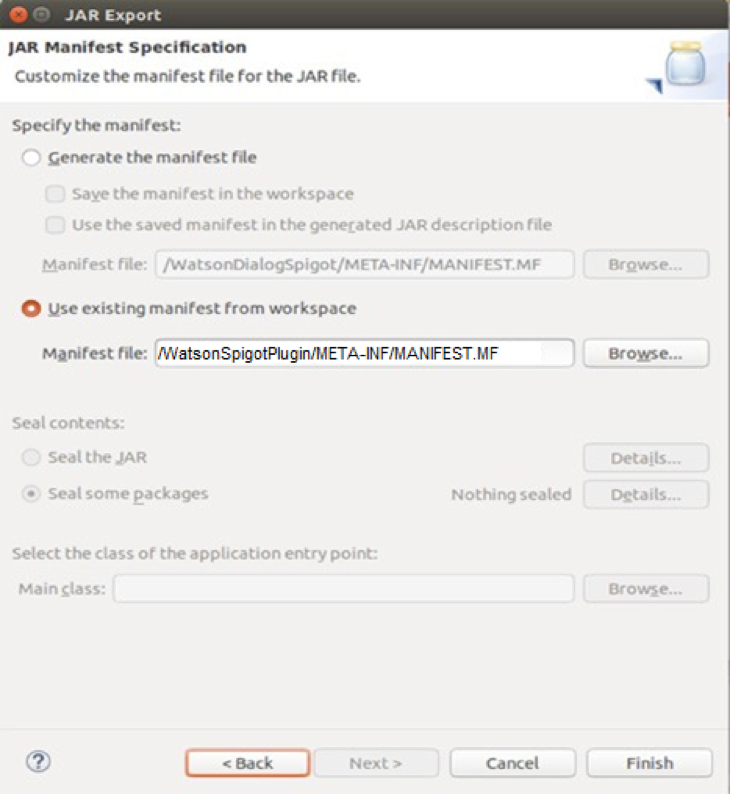 On the JAR Manifest Specification page, make sure to select the option to use existing manifest from workspace. Click Finish. If you see a warning: “JAR export finished with warnings,” you may be using a different version of the dependencies jar file. docker build ‑t="<repository name>/watsonspigotplugin" . [00:04:07 INFO]: Done (12.659s)! For help, type "help" or "?" Connect your Minecraft client to your server (as described in the previous tutorials in this series). 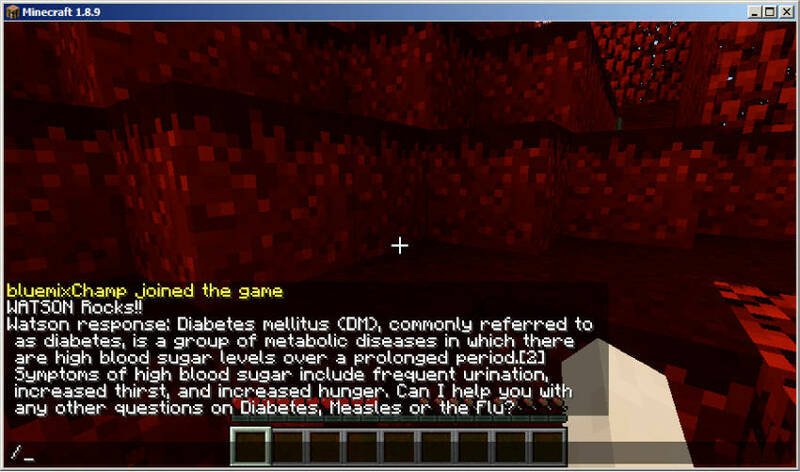 Once connected, ask Watson a question such as /Watson “What is diabetes.” The question text is passed to the Watson Assistant instance and the response is provided back to the player. 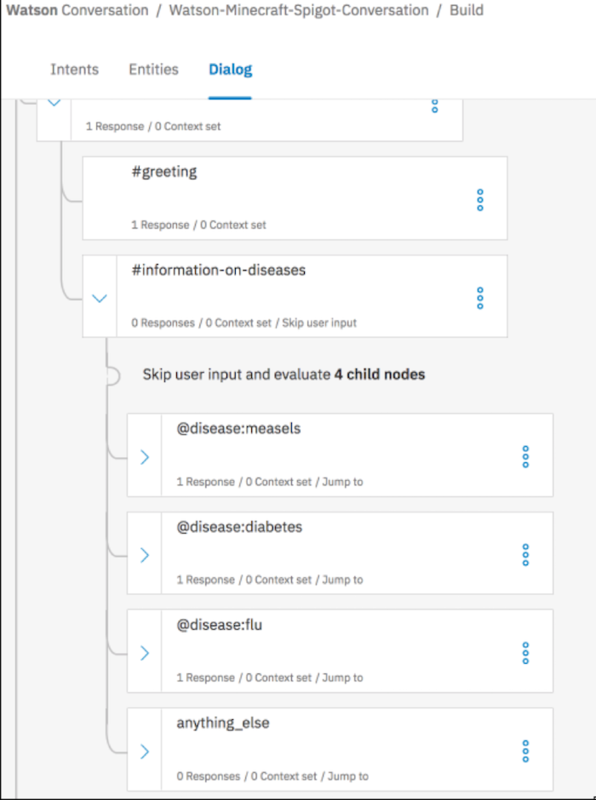 The sample Watson Assistant accompanying this tutorial can provide responses to simple welcome and goodbye messages along with responses to questions like what is diabetes, measles and the flu. So far, we’ve verified the functionality of the Spigot server with the Watson plugin locally in a Docker container. Next, let’s host this server with the WatsonConversation and Disease plugins on IBM Cloud. In step 18 of the previous section we created a Docker file and included the WatsonConversation plugin that was created. 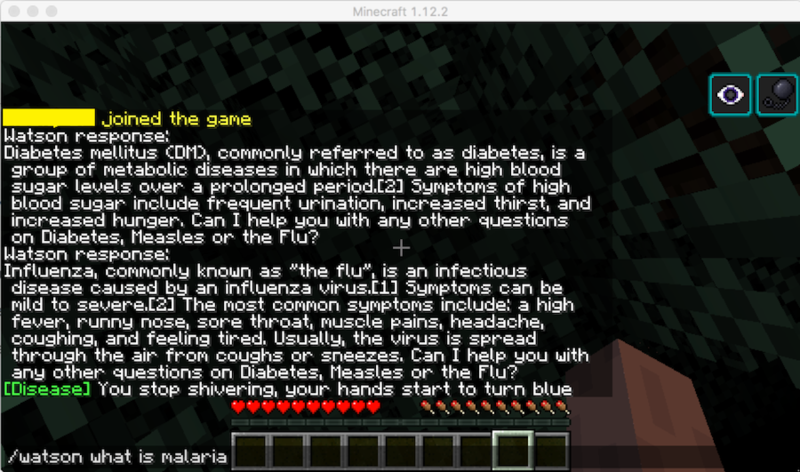 In this section, we introduce a third-party plugin, the Disease plugin, which allows players to bring the terror and fear of infectious diseases to Minecraft town. With these diseases in play, you can leverage Doctor Watson via the plugin we’ve described earlier for information about the definition and symptoms of these diseases as well as the best treatment options. To add the Disease plugin, we’ll need to add one step to the Dockerfile we’ve used earlier to create the Watson plugin. Namely, we’ll need to download the jar for the disease plugin and add it to the plugins directory. For reference, we need to edit the Dockerfile (a copy is included below) and add the one line highlighted (near the bottom of the listing). Given this Dockerfile, you need to execute the same steps you ran earlier to build a Docker image and run it. Change to the directory that contains the Docker file and plugins. Then, build a docker image by executing this command at the command line to proceed, and as always, make sure you don’t forget the period (“.”) at the end! sudo docker build ‑t registry.ng.bluemix.net/<yourname>/watsonspigot . In Part 3, you created a Kubernetes configuration file called deploy.yml. Change the configuration file to point to the new Docker image created and pushed to IBM Cloud as highlighted below and save the changed file in your watsonspigotbluemix directory. Refer to the section “Creating a Cluster” in Part 3 for information on downloading the cluster configuration file. Now run the deployment configuration that you just edited to create a deployment using the create command in kubectl similar to what you did in Part 3. If the deployment fails, you can clean up the deployment with the kubectl delete command and run the create command again. Finally, you need to obtain the public IP address and port number of the container service. Follow the instructions listed in the “Testing the server” section of Part 3 to learn how to get this information. We’ll leave the task of enhancing the Watson Assistant as an exercise for the reader. You now know how to combine several plugins including Watson services in your Minecraft server to create a more engaging gaming experience. Now you’ve seen how to integrate the Watson Assistant service in a Spigot server and host it in a Docker container on IBM Cloud. While we have focused on the Watson Assistant service, you can use the same approach for more engaging gaming by using one or more of the other Watson services, such as Personality Insights (think about building teams of players), Natural Language Classifier (think about understanding player intent from their questions), and Visual Recognition (think about recognizing disease symptoms from images). This concludes this tutorial series. Here’s to taking your Minecraft experience up a notch!